It wasn't my plan to have leftover risotto, however, my last minute change of plans meant that what was going to be reheated for dinner would not enough for dinner for six. Not one to waste I decided that there would be enough to convert into risotto balls for pre dinner snacks. Served with some 'garlicky' aioli and dinner was off to a good start. A quick blend of good quality commercial mayonnaise, chopped parsley and a little crushed garlic. 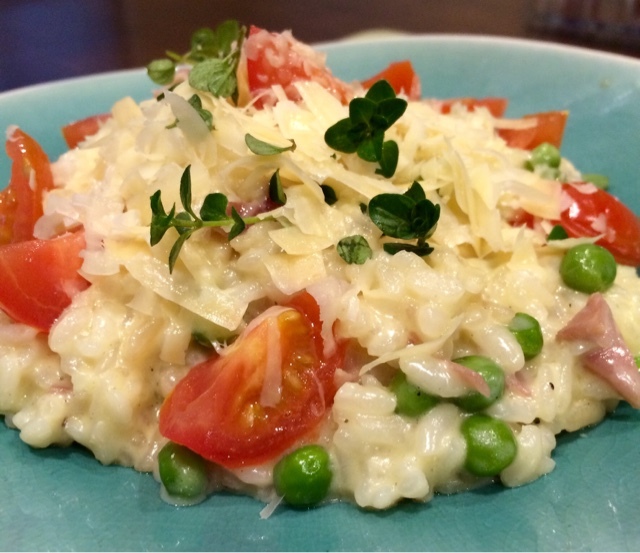 I used pea and prosciutto risotto but any variety providing the the flavourings were in small pieces would work. The mixture needs to be rolled into balls so large bits of pumpkin or big chunks of mushroom would need to be cut up in order to make a smooth rounded ball. Risotto tends to thicken when cold. An egg yolk should be added and the mixture may need some additional rice flour or flour to bind and make it firm enough to roll into balls. For an extra treat add a small cube or piece of tasty cheese in the middle of each ball. 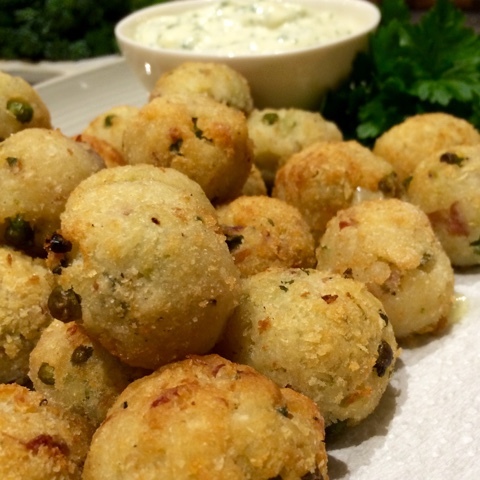 Roll the risotto balls in flour, egg wash and breadcrumbs. Deep fry the risotto balls or blanch the balls in hot oil until just starting to colour, remove and drain on paper towel and then continue cooking in a hot oven. 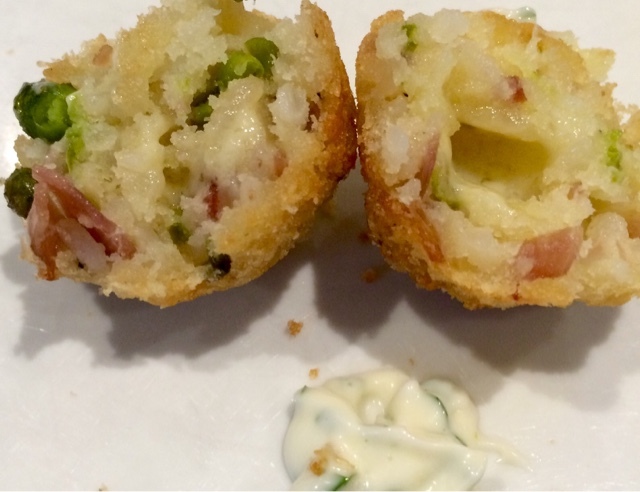 The risotto balls can be sprayed with cooking spray and baked rather than fried. If you do not have leftover risotto or need a recipe you can use this recipe to make the risotto base, parmesan can be substituted for the blue cheese.